Next week, I’ll be presenting on SQL Server Developer Tools (SSDT) at two SQL Server User Groups. Will I see you there? If you haven’t already heard, SSDT is the newest SQL Server development environment in Visual Studio 2010, released as part of SQL Server 2012 (codename “Denali”). You can download the current CTP3, but Juneau is not included with the Denali CTP3 bits. Instead, it’s a separate download via the Web Platform Installer at: http://www.microsoft.com/web/gallery/install.aspx?appid=JUNEAU10. You can get a primer on SSDT by reading my earlier introductory blog post. Hopefully that inspires you to come meet me in NJ or NYC next week to get an up-close look at SSDT with lots of demos. Session abstract below. Hope to see you! With the upcoming release of SQL Server 2012 (codename “Denali”), SQL Server Developer Tools (SSDT, codename “Juneau”) will serve as your primary development environment for building applications with SQL Server. While SQL Server Management Studio (SSMS) continues to serve as the primary tool for database administrators, SSDT represents a brand new experience. SSDT plugs in to Visual Studio and provides a new SQL Server node in Server Explorer for connected development of on-premises or cloud databases, and also provides a new database project type for offline development. With SSDT, developers can finally enjoy building applications without constantly switching between Visual Studio and SSMS. 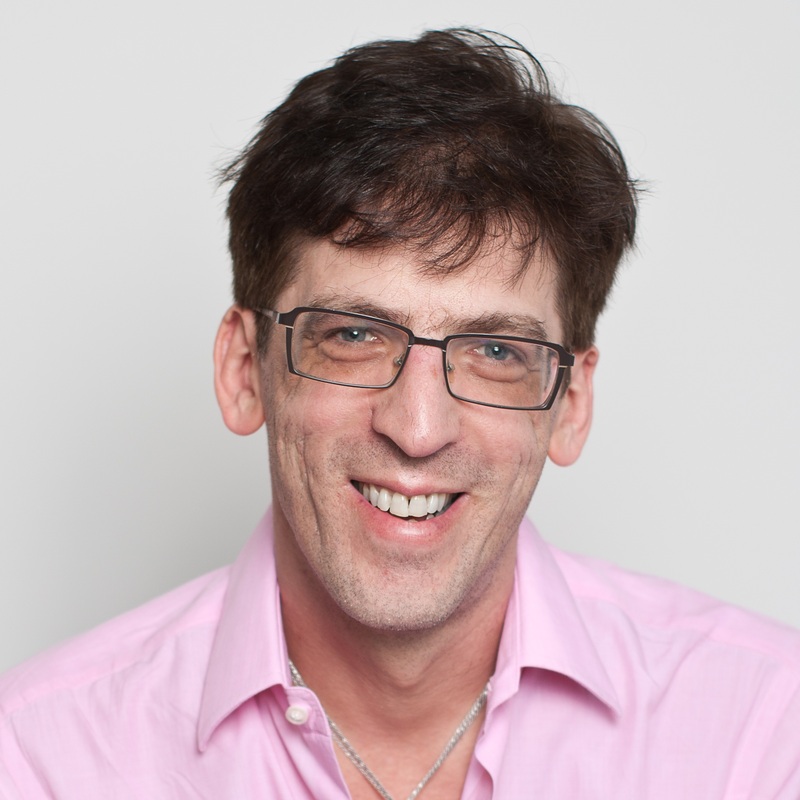 In this session, Lenni will demonstrate how SSDT can be used to develop for (and deploy to) on-premise and SQL Azure databases. In addition to replicating most of the functionality found in SSMS, you will learn how to use features such as code navigation, IntelliSense, and refactoring with your database model-indispensable tools previously available only for traditional application development in Visual Studio. We’ll also cover the new declarative model that allows you to design databases offline and under source control right from within your solution in Visual Studio. Don’t miss out on this demo-centric information-packed session on the next generation of database development tools for SQL Server! It’s a File System… It’s a Database Table… It’s SQL Server Denali FileTable! SQL Server 2008 introduced FILESTREAM, an innovative feature that integrates the relational database engine with the NTFS file system to provide highly efficient storage and management of BLOBs. Now FileTable, a new feature coming in the next version of SQL Server (code-named “Denali”), builds on FILESTREAM and takes database BLOB management to the next level. In this post, I’ll explain FileTable and show you how it works. I also encourage you to experiment with FileTable yourself by downloading and installing SQL Server Denali CTP3 from http://bit.ly/DenaliCTP3 (but be sure to install it on a virtual machine; beta software can be difficult or impossible to uninstall). Note: FileTable relies on FILESTREAM, so you need to understand FILESTREAM to fully understand FileTable. If you’re new to FILESTREAM, you can get the necessary background by reading my three earlier blog posts Introducing FILESTREAM, Enabling and Using FILESTREAM, and Using SqlFileStream. Every FileTable implements a logical folder structure using the path_locator column. This is a hierarchyid value that denotes the location of each file and folder (row) within the logical file system (table). The hierarchyid data type was introduced in SQL Server 2008 as a binary value that, relative to other hierarchyid values in the same tree structure, identifies a unique node position (reminder to self: blog on hierarchyid!). It is implemented as a system CLR type, which means that it’s a .NET framework class, and has a set of methods you can use (e.g., GetAncestor, GetDescendant, GetReparentedValue, IsDescendantOf, etc.) to traverse and manipulate the hierarchy. Thus, it’s perfect for casting the hierarchical structure of a file system over a relational table, as FileTable does. The path_locator column is defined as the table’s primary key with a non-clustered index. A separate key value is also stored in the stream_id column with a non-clustered unique index. This is the uniqueidentifier ROWGUIDCOL value required by any table with varbinary(max) FILESTREAM columns, so FileTable is no exception. And unlike path_locator, this unique value will never change once it is assigned to a new FileTable row, even if the row is later “reparented” (i.e., moved to another location in the hierarchy). Thus, you should treat stream_id as each row’s “ID,” even though it isn’t the table’s primary key. Every row in a FileTable corresponds precisely to either a single file or folder, as determined by the bit value in the is_directory column. The file or folder name is stored in the name column as an nvarchar(255) string. All of the other column names are self-describing, and are used to store typical file system information such as various timestamps and storage attributes. The actual file content (the BLOB itself) is stored in the file_stream column, which is a varbinary(max) data type decorated with the FILESTREAM attribute. This means that the binary content in the file_stream column is stored in the NTFS file system that SQL Server is managing behind the scenes, rather than the structured file groups where all the other table data is stored (standard FILESTREAM behavior in SQL Server 2008). The parent_path_locator column returns the result of calling GetAncestor(1) on path_locator to obtain the path_locator to the parent folder of any file or folder in the table. The file_type column returns the extension of the filename parsed from the string value in the name column. And the cached_file_size column returns the number of bytes stored in the file_stream column (these are BLOBs stored in SQL Server’s internally-managed NTFS file system behind the scenes). Take a moment to digest what’s happening here. In addition to the programmatic FILESTREAM access using either T-SQL or SqlFileStream, Denali now offers a third interface to FILESTREAM: A logical file system. In a sense, this fills the SQL Server 2008 FILESTREAM gap in which the file system itself is completely inaccessible. This is not to say that FileTable lets you directly access SQL Server’s internally managed NTFS file system; certainly not. That remains obfuscated and private, as it continues to function in standard FILESTREAM fashion against BLOB data that just happens to be in a FileTable instead of a regular table. What we do get is an abstraction layer over the FileTable that functions as a standard file system. In this logical file system, everything about each file and folder—except the BLOB content of the files themselves—is stored in the FileTable’s structured file group, while the BLOBs themselves are physically stored in the NTFS file system. So you can see that there’s really nothing new beneath the FileTable layer; as before, SQL Server synchronizes transactional access between the row in the FileTable and its corresponding BLOB content in the NTFS file system to ensure that integrity is properly maintained between them. As with T-SQL access, this synchronization occurs implicitly when manipulating the FileTable via the exposed Windows file share. And, being an ordinary table in virtually every respect, you also have the option to use SqlFileStream with explicit transaction synchronization for the fastest possible streaming of BLOBs into and out of a FileTable. I don’t know about you, but I find all of this extremely appealing. We now have total flexibility for BLOB storage in the database. With FileTable, you can easily migrate existing applications that work against physical file systems without writing any custom T-SQL or fancy SqlFileStream code. Just use a FileTable, let the existing applications continue working without modification, and enjoy the benefits of your files becoming an integral part of the SQL Server database. FILESTREAM must be enabled for file system access at both the service level (either during setup, or later via the SQL Server Configuration Manager) and at the instance level. Complete details can be found in my Enabling and Using FILESTREAM post. Once enabled, SQL Server exposes a file share for all the FileTable-enabled databases you create under the SQL Server instance (by default, the share name is MSSQLSERVER). The following statement enables FILESTREAM at the instance level for file system access (level 2). Naturally, a FileTable-enabled database must include the FILEGROUP…CONTAINS FILESTREAM clause expected of any FILESTREAM-enabled database. In addition, you must also specify two parameters in the SET FILESTREAM clause of the the CREATE DATABASE (or ALTER DATABASE) statement. The DIRECTORY_NAME specifies the name of the folder that will be created for this database in the root file share associated with the instance. And enabling full non-transacted access with NON_TRANSACTED_ACCESS=FULL exposes every FileTable within the database as a subfolder beneath the database folder of the instance’s file share. Your FileTable is ready to use. You will find a root PhotoFiles folder for the FileTable beneath the PhotoLibrary folder created for the database in the Windows file share for the instance. 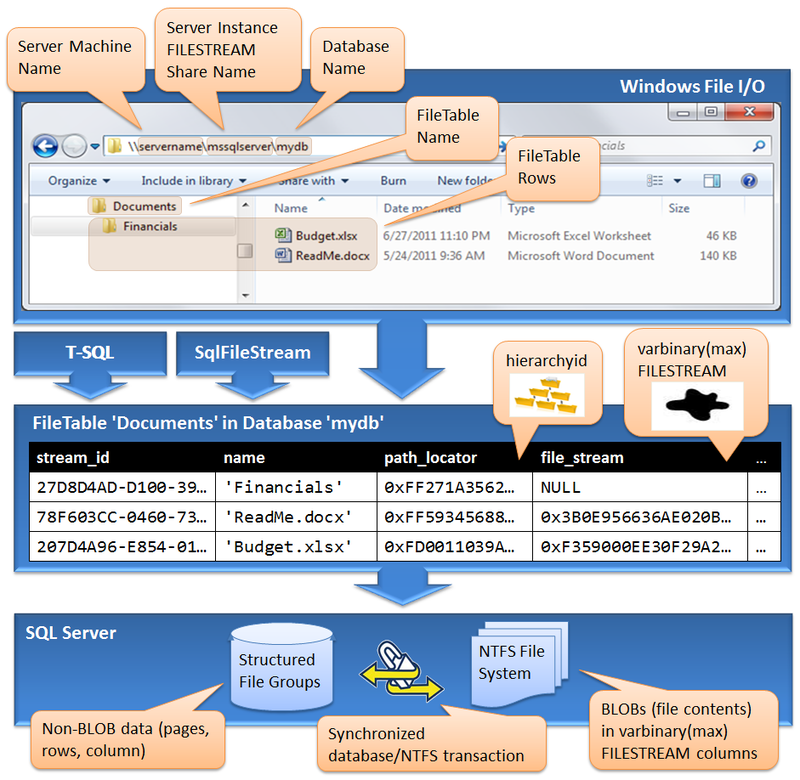 You can interact with the FileTable using T-SQL, SqlFileStream, or the logical file system exposed by the Windows file share.